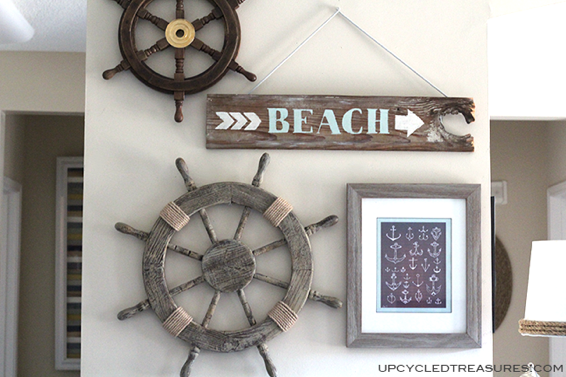 An old beach sign and a ship's helm are the PERFECT companions for this lovely beach inspired wall gallery! Katie went old school in creating her reclaimed wood beach sign. Finding a used projector was the key in transferring her image into the wood. From there, she hand painted her tracings in. Her post houses a few other cool tips on getting the look, so don't miss it! Teaming her DIY beach sign up with a ship's helm was a genius idea. I adored how the four corners are wrapped with rope. Love the look! This whole wall gallery is so inspiring. I adore how it carries the same theme. This is the perfect fix for seasonal decorating at it's best... it's pretty to look at but not in your way. I'd love to have a revolving wall like this... thinking!